BNSF had an accident in a Denver rail yard that spliied a lot of beer. Here is a link to local TV station news artile. Click on the link, read the short article, and then click on View Slide Show for 17 pictures of the mess. I wonder how the haz-mat team dealt with that. 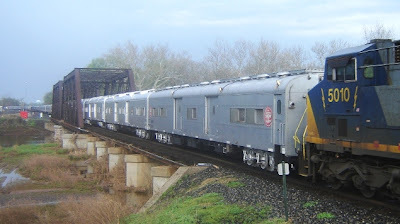 This picture is of the NS Office Car Special Train near Bloomsbury, NJ on Tuesday 5/22/07. The following is from the OGR Forum (O Guage Railroading). It was written by a lawyer who has been following these matters. May 22, 2007-Lionel and MTH's attorneys were back in a New York bankruptcy court this morning. Lionel CEO Jerry Calabrese was present in court. MTH's Mike Wolf was not. Lionel's lawyer, Adam Harris quickly informed Judge Lifland that Lionel filed their bankruptcy reorganization plan with the court yesterday. Among the items in the plan is payment in full of all unsecured claims with interest. The plan is necessary in order for Lionel to begin their exit from bankruptcy. Lionel has been in bankruptcy since November 15, 2004, a period of over 2 1/2years. Mr. Harris continued by stating the reorganization plan can be confirmed by the court upon the happening of two conditions, 1)resolution of MTH's separate trade secrets and $17.5 million dollar patent infringement lawsuits and 2)obtaining exit financing to make the payments proposed in the plan. Mr. Harris noted obtaining the financing would be "easy" once the trade secrets and patent infringement cases are concluded. To resolve the trade secrets and patent infringement cases, Mr. Harris once again requested the court conduct a damages estimation hearing, with the trade secrets case being tried first, or concurrently with the patent infringement case. The court did not set a trial date for the damages estimation hearing. Mr. Harris stated he would file a motion with the court next week which would address some logistical concerns, and the court could then schedule a trial date. Judge Lifland agreed with Mr. Harris's request. 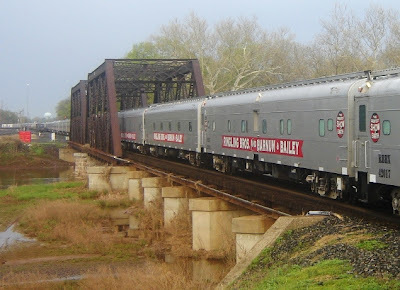 Lastly, Mr. Harris informed the court that after extensive mediation, the two rival model train makers were unable to settle either the trade secrets or patent infringement case. MTH's attorney Alec Ostrow then addressed the court. He objected to the court scheduling a damages estimation hearing. Judge lifland, becoming fustrated and annoyed, interrupted and stated, "its time get this case moving, no more dillydallying. Its been mired in mud for a long period." Twice more, Mr. Ostrow persisted, and objected to a damages estimation hearing. Judge Lifland again cut off Mr. Ostrow, stating, "This isn't a debate." Mr. Ostrow then stated he would set forth his objections in papers in response to Lionel's motion. In addition to today, Mr. Ostrow has objected several times at past court conferences to the court scheduling a damages estimation hearing. His reason for doing this is, the appeals court, in its December 14, 2006 decision in the trade secrets case, remanded it to the trial court. That would be the Federal District Court for the Eastern District of Michigan. This is the court where a jury awarded MTH $40 million dollars on June 7, 2004. Strategically, based on past experience, MTH's attorneys have decided they would fare better in front of a Detroit jury, than a New York bankrutpcy judge who is of the opinion that Lionel's bankruptcy has taken a long time. Of course, Lionel's attorneys want to try the case in front of Judge Lifland, who is already very familar with the details of the trade secrets and patent infringement cases. According to Judge Lifland, the Bankruptcy Code gives him the power to pull the case from the District Court, and try it, in the interests of expediting Lionel's exit from bankruptcy. This essentially takes away MTH's right to a jury trial. In this and in past articles, I have used the legal term "damages estimation hearing." That term is a little misleading. On its face, the term implies the court will 1) estimate damages only and not possible liability and 2)possibly estimate a numerical range, not a specfic number. In speaking with Mr. Harris following today's court proceedings, he explained that Judge Lifland will try both the trade secrets and patent infringement cases as if they were regular trials, determining first, any POSSIBLE liability (responsibility) on Lionel's part, and upon the finding of any wrongdoing 2)determining the exact of amount of damages MTH would be entitled to. For example, in the trade secrets case, MTH must establish Lionel or its employees were involved in the theft of the locomotive blueprints or design plans, and then establish they were damaged by the theft, such as thorough, lost sales. According to Mr. Harris, a damages estimation hearing, could take place this summer. I will continue to keep all updated as necessary. BNSF ran what is believed to be the U.S. rail industry's first 10,000-foot intermodal train from Los Angeles to Logistics Park in Chicago earlier this week, reports Trains.com. The 10,009-foot (including power) international intermodal stack train departed Los Angeles on May 13 and arrived at the Chicago intermodal terminal May 15. The train ran on BNSF's Transcon, on which BNSF has been steadily increasing the amount of double track in recent years. 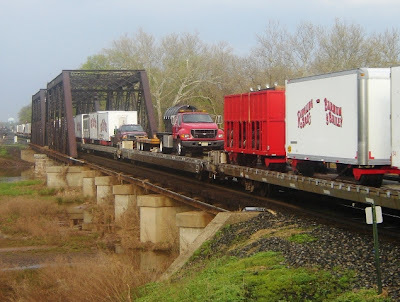 Because almost the entire 2,200-mile route has now been double tracked, siding length was not an issue. The train used distributed power: four locomotives in the front and two in the back. BNSF is studying the use of longer trains to maximize the amount of containers that it can carry while minimizing the number of trains it takes to move the containers, which increases efficiency and takes advantage of the aggressive program of double tracking BNSF has been conducting on the Los Angeles to Chicago route for several years. Sorry, this is about a week late. May 10th was Golden Spike Day. This comemorates the day in 1869 when the golden spike was driven at Promontory Summit, Utah Territory, thus joining East and West by rail. You can read more about it at the following National Park Service web site. Yes, we have kites too. Besides all our model railroad stuff, we also carry plastic model kits for airplanes, ships, automobiles, and military vehicles. And we even have some RC (radio control) items. If we don’t have something you want, we can order it for you. Please stop in and check us out. And buy a kite, get outdoors, and enjoy the great weather we are having. along the Lehigh Line were only two trains. From what I was told, NS 212, 64J and 18N had already passed by prior to my arrival at Pattenburg, NJ. The trains I did see though made for a nice sight on this spring day. NS 20R came through Pattenburg Tunnel around 8:55. Motive power would be NS 2752 (SD70M-2) and NS 9427 (C40-9W). Shades of CR! NS 24Z would have PRR 8336 (C40-8W, ex-CR 6088) as the leader coupled to NS 7644 (ES40DC) around 9:11. Both trains would be instructed to hold the siding down at CP 51 waiting for NS 21M. 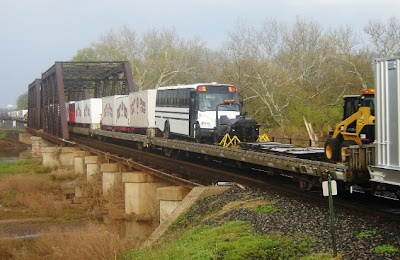 Once 21M was clear, NS 20R would be through Three Bridges, NJ at 10:28 and NS 24Z would follow a little later at 10:40. NS 18N @ 6:45-red / silver BNSF 748 (C44-9W) and NS 2537 (SD70) would bring sixty-eight autoracks east in an early morning rain shower. NS Intermodal, symbol unknown, @ 6:55 had two C40-9Ws, NS 9958 and NS 9878, for power. NS 24V would hold for the circus train to proceed before continuing its eastbound journey over CR's Shared Assets Lehigh Line. Motive power was two C40-9Ws, NS 9645 and NS 9322. 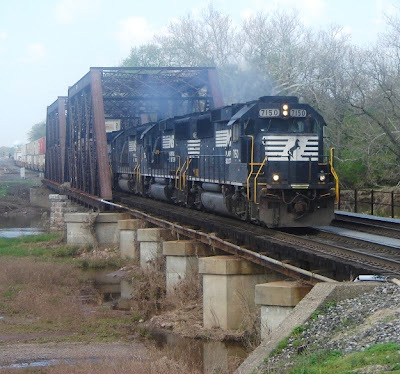 NS 21M-after holding the main for CSX 916 and NS 24V to pass on the siding, 21M continued its trip west. Motive power was NS 2632 (SD70M), NS 7552 (ES40DC), PRR 8385 (C40-8W, ex-CR 6173) and PRR 8310 (C40-8, ex-CR 6045). 21M's departure time wasn't recorded. NS 212-had NS 9626 (C40-9W) and NS 2535 (SD70) bringing a mixture of autoracks and intermodals east. CSX Q300 @ 9:00-would have CSX 7367 (C40-8W) and CSX 5435 (ES44DC) bring a short train of twenty-seven cars of mixed freight east. NS 214 @ 9:17 would have four GP60s, NS 7150, NS 7101, NS 7120 and NS 7126 for its power consist. NS 20G @ 10:10-was the morning's final train for me. Motive power would be NS 9796 (C40-9W) and UP 5106 (SD70M). Nine trains in basically three hours, not a bad way to start off this Monday morning. 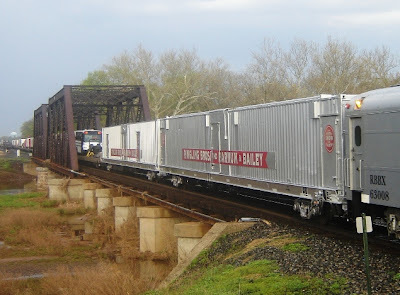 for the Ringling Bothers Red Unit Circus Train started out in Philadelphia, headed north on the Trenton Line and is seen here crossing over on to CR's Shared Asset Lehigh Line at Port Reading Jct. near Manville NJ at 7:55. 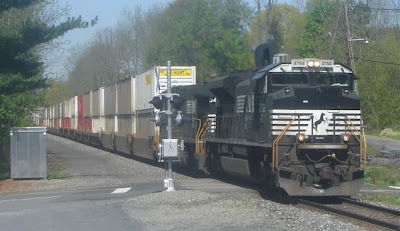 It is seen taking the passing siding as NS 21M was holding the main on this meet. 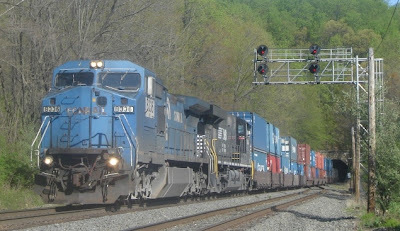 Motive power for CSX 916-30 would be CSX 4715 (SD70MAC) and CSX 5010 (CW44-6) to bring the fifty-eight cars to Worcester, MA. The Red Unit would weigh in at 4,265 tons and was 5,148 feet long. Only two weeks earlier, the Red Unit would be delayed in departing NYC to travel to Philadelphia due to the nor'easter that dumped an estimated eight inches of rain causing extensive flooding in this area. Some of that debris from the flooding can still be seen stuck on the bridge.